Rio de Janeiro - Faou Foundation announces Ring: One with Nature by Mariko Mori is completed and on permanent view to the public in Cunhambebe State Park in Muriqui, Mangaratiba, Rio de Janeiro State, as gifted by the Foundation to the Instituto Estadual do Ambiente (State Institute of the Environment, Brazil) and the State of Rio de Janeiro. The installation remains a legacy of the Rio 2016 Olympic and Paralympic Games. The work premiered August 2nd, with the full endorsement of the Celebra Cultural Program of the Rio 2016 Olympic and Paralympic games. The artist was inspired by her dream of 7 years ago, in which a heavenly ring appeared above a waterfall. After a wide ranging search for the waterfall of her vision including 30 sites and 5 years. Ring was finally permanently installed at the Véu da Noiva waterfall, meaning “the veil of the bride,” located in Muriqui, Mangaratiba, in Rio de Janeiro State. This new work realizes this vision, featuring a luminous 3m diameter ring suspended at the peak of a 58-meter-high cascade. 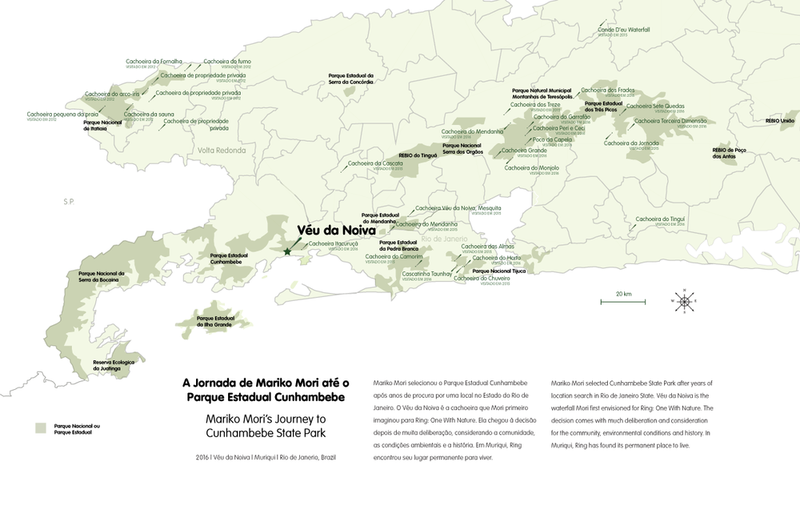 Click the map to learn more about the journey Mariko Mori and Faou Foundation went on to find Veu da Noiva. MORI ISO CORPORATION, JOHN S. WADSWORTH JR., ROSENKRANZ FOUNDATION THE HAYDEN FAMILY FOUNDATION, WILBUR L. ROSS JR.